Your Green Contractor (YGC) was recently mentioned in Marijuana Venture, a leading journal for growers and retailers in the Cannabis industry. In an article entitled, “Words Of Wisdom“, Marijuana Venture shared with its readers quotes from various cannabis industry contributors that the publication felt were worthy enough to be mentioned in print. 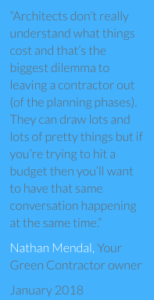 Nathan Mendel, the owner of YGC, was quoted on his thoughts relating to contractor participation in the planning process. All quotes were taken from comments made throughout 2018. YGC is grateful to have been included in this notable list of industry leaders. Architects are not in the business of pricing projects; their primary function is to design the project. An architect will approach a project from the position of how to best design what the client has envisioned. Price will not be a primary factor. If the client has a contractor in place early on, that contractor will guide and manage the designer while keeping the budget as a top priority. This will translate to less surprises as the project progresses. Asking an architect to provide feedback related to pricing is like asking a contractor to design the building. A contractor will approach a client’s project with the budget as a primary guardrail. The client and the contractor will determine what the budget should be and then pass that along to the designer. In this way, the architect must adhere to clearly defined budgetary parameters. If an architect designs the project without an initial budget in place, the end result will almost always be the client asking for a re-design. Redesigns will likely translate to the project being over budget. Time is a critical factor. If the architect designs without taking monetary constraints into consideration, it will likely take multiple contractor bids before the client realizes the project cannot be completed within their initial projections. Once this happens, delays begin to compound as new plans must be created and time estimations will change. If you are sure to include a contractor early in your preparations, there will be little in the way of surprises as your project moves from the planning stages to completion. The client, the contractor and the architect should always be considered as a foundational team. Keeping this in mind will save clients money, time and frustration. YGC is always on the lookout for new and exciting commercial build-outs of marijuana facilities. YGC can be contacted at 303-419-6832 or you can submit a request via our online contact form found here.